Unable to locate this species in the field, Roger Heim and Rolf Singer based their descriptions of this mushroom on dried specimens purchased from Matlazincan Indians in the marketplace of Tenango del Valle, in the Nevado de Toluca region of the State of Mexico. In 1958 Heim described this fungus as Psilocybe wassonii, but without any Latin designation; Singer and Smith described it in the same year as Psilocybe muliercula (muliercula = "little women"). Both descriptions reported this fungus growing in Pinus forests surrounding the town of Tenango del Valle. However, after several expeditions to the area, Dr. Gaston Guzman located it 10 kilometers from Tenango del Valle in an Abies forest on the slopes of the Nevado de Toluca [Guzman 1958; letter to author 1999]. Closely related to Psilocybe zapotecorum, this mushroom prefers a similar habitat -- rich, dark soils in marshy areas -- where it can be found fruiting throughout summer in small groups or dense clusters. 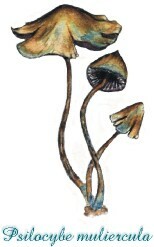 In 1979 Guzman, along with Stephen H. Pollock, described a new entheogenic species found by them in the Naolinco region of the State of Veracruz, Mexico. This mushroom prefers rich soils in deciduous forests where it can be found fruiting singly or in small groups. The pseudorhiza at the base of the stalk is characteristic. This species was named Psilocybe wassoniorum to honor Wasson and his wife Valentina, and to remedy the nomenclatural dispute regarding Psilocybe wassonii. Above: "Wasson's Psilocybe" (Psilocybe wassoniorum Guzman et Pollock). Aquarelle by Carol Ann Wells. Courtesy The Stain Blue Museum Collection. Guzman, G. "El habitat de Psilocybe muliercula Singer & Smith (=Ps. wassonii Heim), agaricaceo alucinogeno mexicano." Revista de la Sociedad Mexicana de Historia Natural 19: 215-229 (1958). Guzman, G. The Genus Psilocybe: A Systematic Revision of the Known Species Including the History, Distribution and Chemistry of the Hallucinogenic Species. Beihefte zur Nova Hedwigia Heft 74. J. Cramer, Vaduz, Germany (1983). Guzman, G. "Wasson and the development of Mycology in Mexico." In: Riedlinger, T.J. (Ed.) The Sacred Mushroom Seeker: Essays for R. Gordon Wasson. Ethnomycological Studies No. 11, pp. 83-110. Dioscorides Press, Portland, OR (1990). Guzman, G. and S.H. Pollock. "Tres nuevas especies y dos nuevos registros de los hongos alucinogenos en Mexico y datos sobre su cultivo en el laboratorio." Bol Soc Mex Mic 13: 261-270 (1979). Heim, R. "Diagnose latine du Psilocybe wassonii Heim, espece hallucinogene des Azteques." Revue de Mycologie 23(1): 119-120 (1958). Heim, R. and R.G. Wasson. Les Champignons Hallucinogenes du Mexique. Etudes Ethnologiques, Taxinomiques, Biologiques, Physiologiques et Chimiques. Archives du Museum National d'Histoire Naturelle, Series 7, Vol. VI. Paris, France (1958).